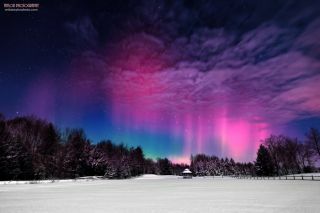 The aurora borealis in the skies above Maine. Mike Taylor is an accomplished landscape astrophotographer who offers night photography and post-processing workshops. Taylor contributed this article to Space.com's Expert Voices: Op-Ed & Insights. On the morning of Feb. 19, the spikes of the Northern Lights were quite strong when I first headed out to see what I could capture close to my home in central Maine. The cloud cover quickly moved out, but then came back after about a half hour — I almost missed the show! This was one of my test shots to check my camera settings and composition. The moon was very bright behind me as I was photographing — only five days since being at its full phase — and washed out a lot of the sky and the aurora , but made for some nice foreground lighting. The snow cover on the ground was over a foot thick and it took me a few minutes to get to a spot a couple hundred feet away where I liked the composition better than this scene, and by the time I continued shooting, the aurora display had calmed down quite a bit. Thus this "test shot" was really my best capture of the show. I'm usually on top of aurora forecasts, but this one caught me a bit by surprise and I was fortunate to start photographing within five minutes of leaving my house. During processing in the digital darkroom, I increased the color saturation and contrast a bit while actually bringing down the highlights to bring out the details in the sky as much as possible. I photographed this image using a full frame Nikon D600 paired with the phenomenal 14-24mm aspherical wide angle lens @ 14mm using an aperture of f/2.8 with a shutter speed of 20 secs, an ISO setting of 800 and with my white balance set to a temperature of Kelvin 3570 on February 19, 2014 at 2:56 AM. The views expressed are those of the author and do not necessarily reflect the views of the publisher. Follow Taylor on his social media sites: https://www.facebook.com/miketaylorphoto, http://gplus.to/miketaylorphoto, http://pinterest.com/taylorphoto1, on his website http://miketaylorphoto.com and through his workshops at http://miketaylorphoto.smugmug.com/Workshops. Follow all of the Expert Voices issues and debates — and become part of the discussion — on Facebook, Twitter and Google +. The views expressed are those of the author and do not necessarily reflect the views of the publisher. This version of the article was originally published on Space.com.